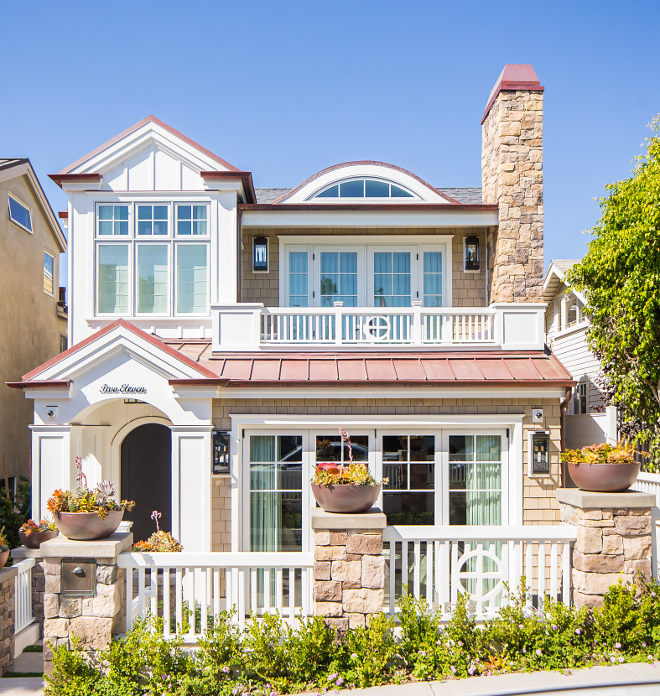 Built by Patterson Custom Homes and with architecture by Brandon Architects ( I completely recommend them if you’re in California! 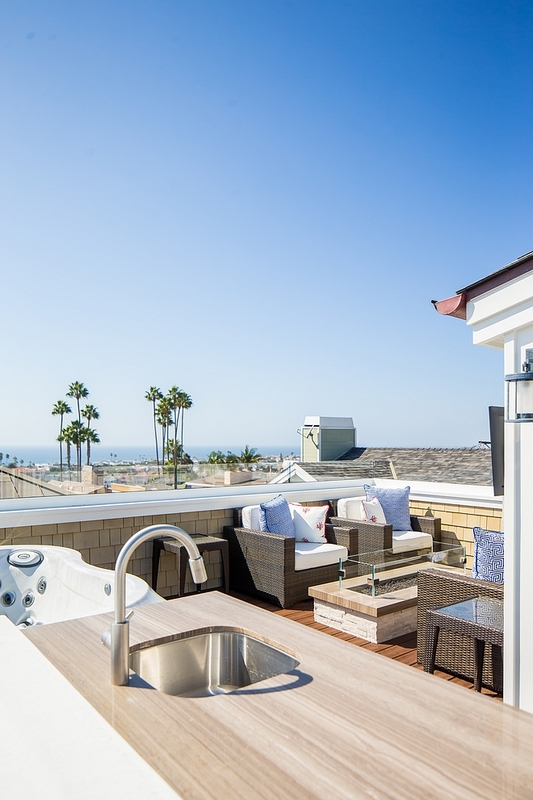 ), this Corona Del Mar, California beach house features one of the most beautiful interiors I have seen lately. 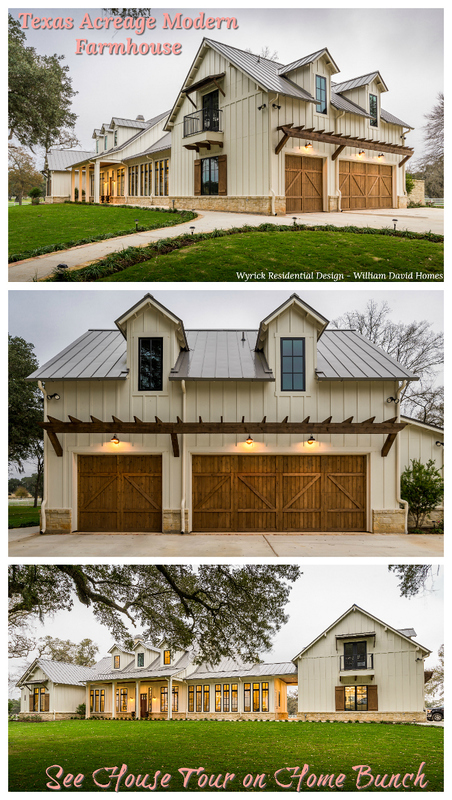 As you will see here, this home is not huge, but the well-designed spaces make the most of every square foot. 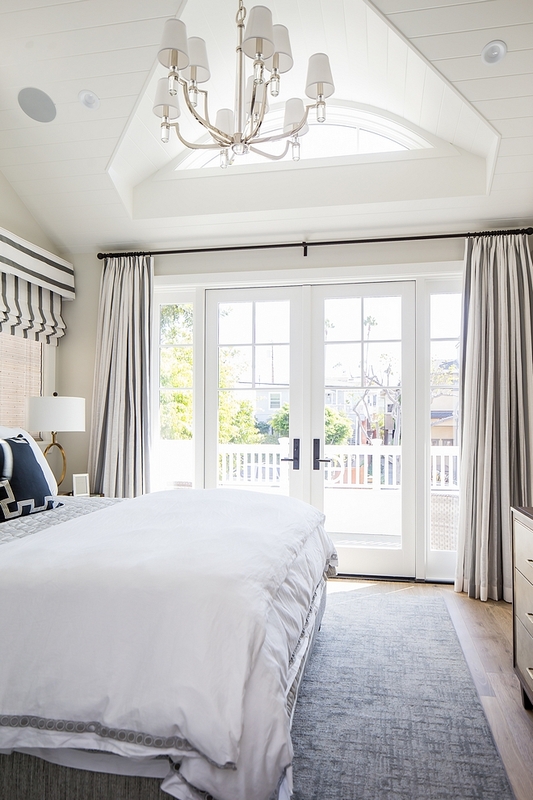 The home features an open main floor with a stunning kitchen and upstairs you will find a gorgeous master bedroom and bathroom that is perfect to relax in after a long day. 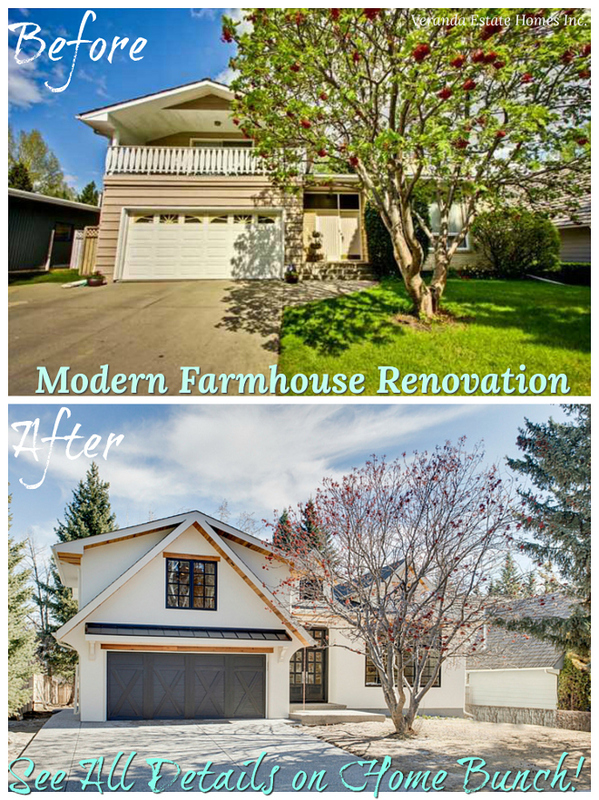 Exterior features single siding, board and batten and custom trim work. Shingle Siding: Eastern Red Cedar shingles, topped with Cabot Bleaching Oil. Exterior Stone: Eldorado Rough Cut – Autumn Leaf. 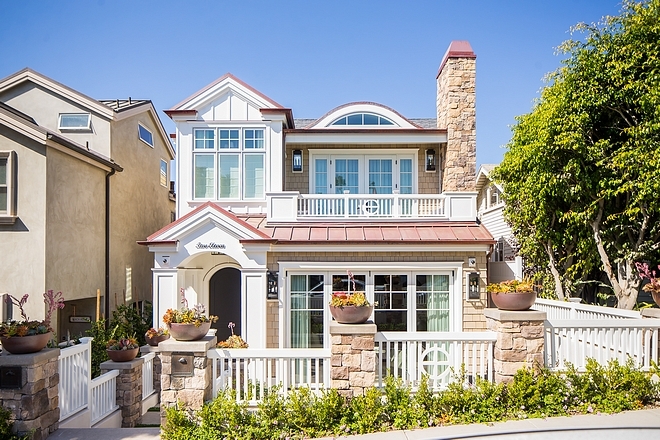 The pilasters feature custom irrigated planters – similar here, here, here, here & here. Landscape includes wax leaf privets, grass, and succulents. Front Door Set: Emtek Baden. 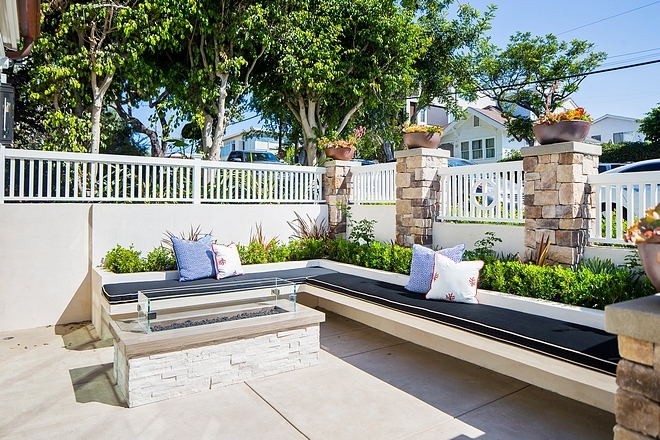 This inviting courtyard features a custom floating bench against flower beds. Flooring is acid washed concrete. The custom fireglass firepit features stone surround with Granite top – similar here, here, here, here & here. 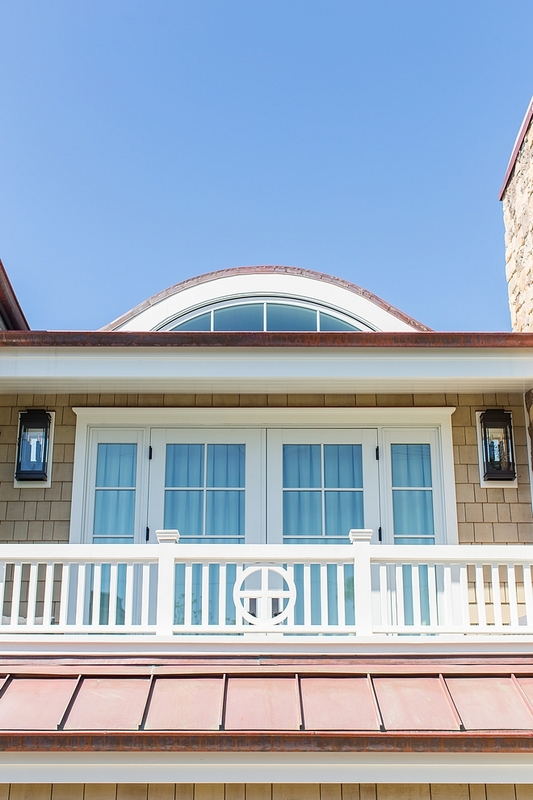 The balcony custom trim matches the detail on the fence. 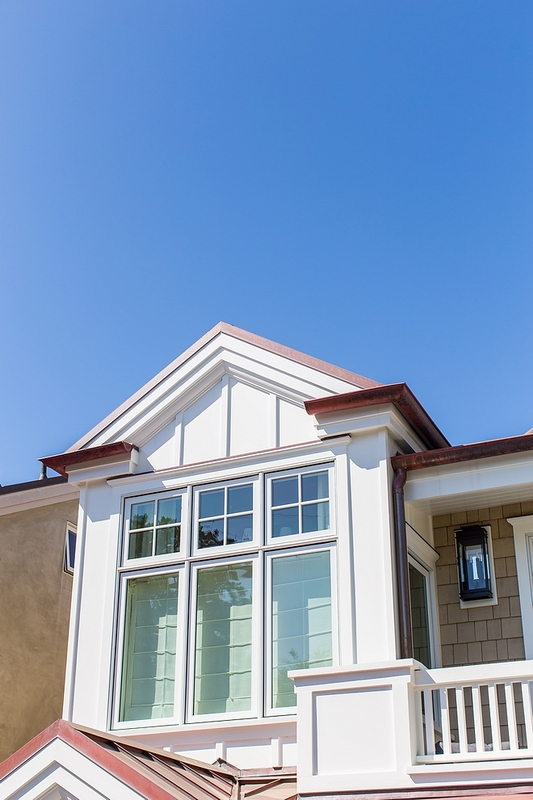 Windows are Jeld- Wen Premiun Series, Aluminum Clad. 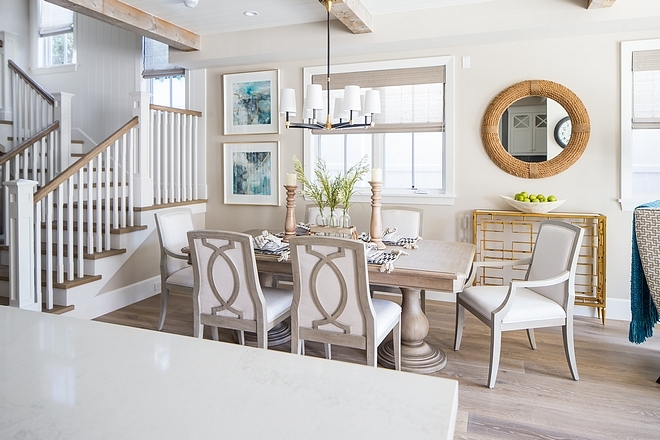 The interior paint color is Dunn Edwards DE6213 Fine Grain; which is a light tan/greige paint color. 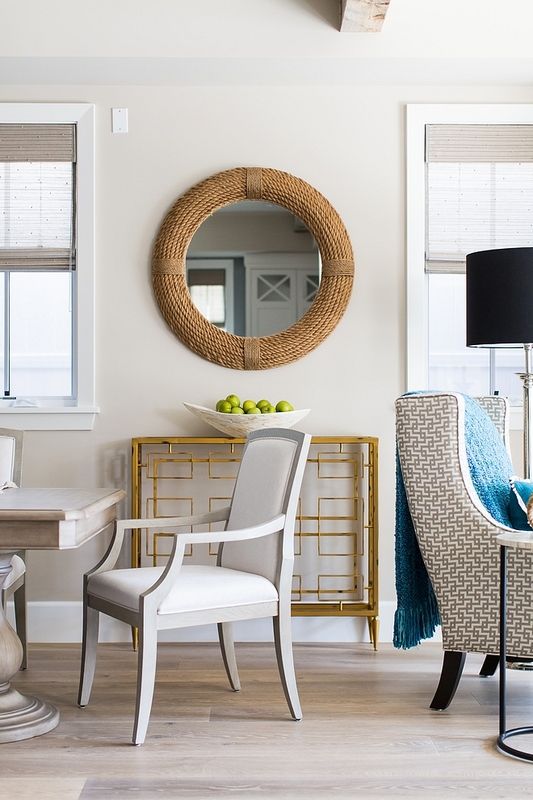 This neutral color feels neutral, beachy and it works well with almost any type of light. The fireplace features horizontal tongue and groove. 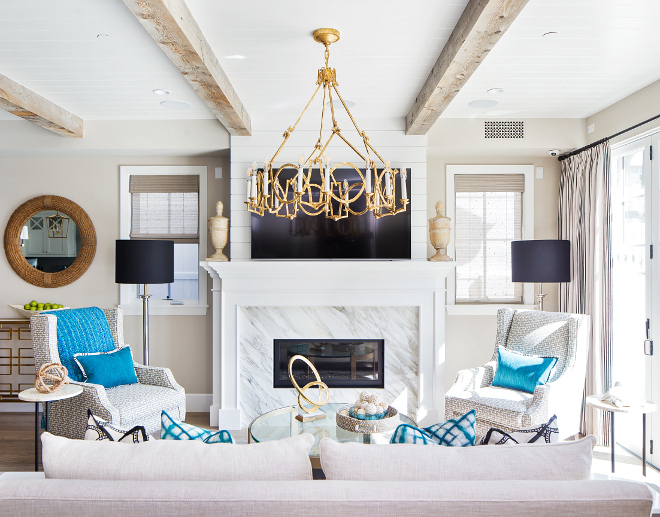 Chandelier is Visual Comfort (also available here). Fireplace Surround Stone: Calcutta Marble. 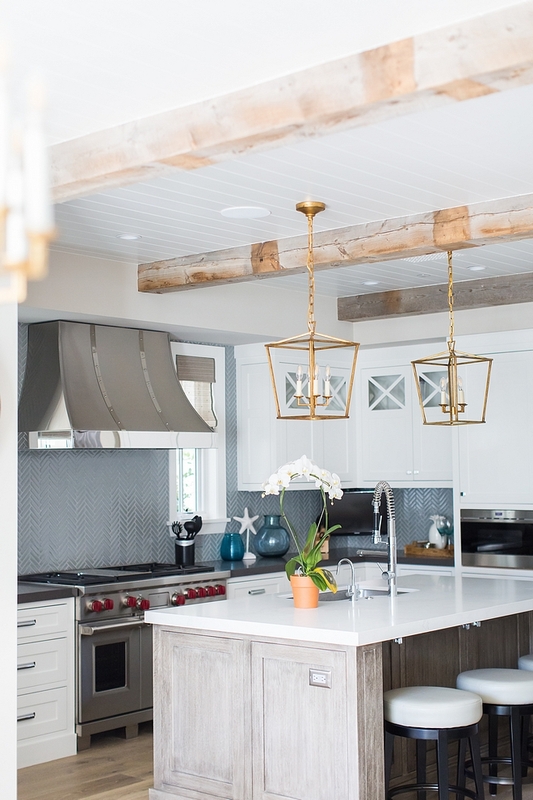 Isn’t this a dreamy kitchen? Notice that it’s not too big, but it’s truly well-planned. Wall paint color continues to be Dunn Edwards DE6213 Fine Grain. 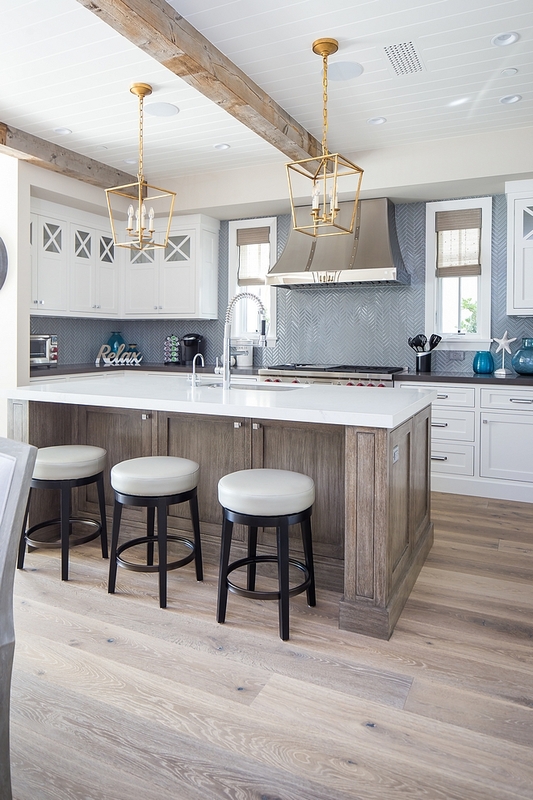 The kitchen island is Rift Oak, face framed. Perimeter countertop is Pewter Quartz, Mitered Edge. Range is a 48″ Wolf Dual Fuel – similar here. Hardware: RH – Similar Pulls: here (7″) or here (5″). Similar Knobs: here – These are beautifully made and quite affordable hardware- often recommended by interior designers. 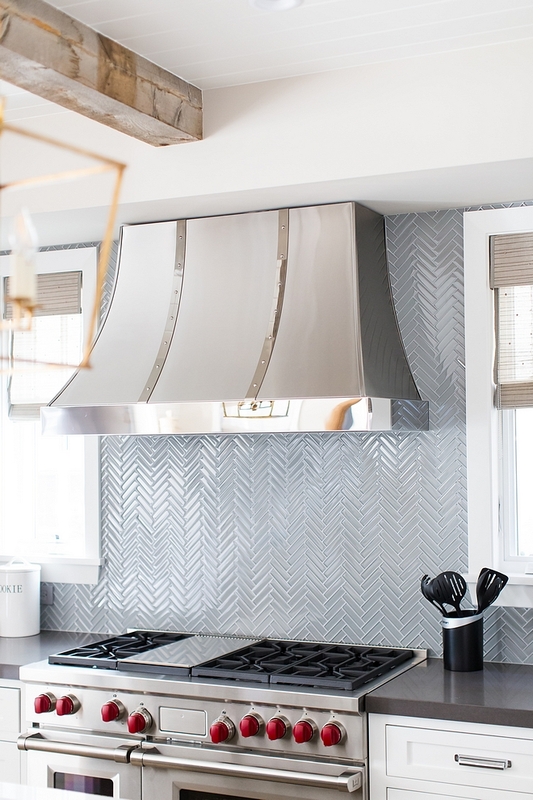 Backsplash tile is Akdo ¼ Herringbone in Dove Gray – similar here, here & here. 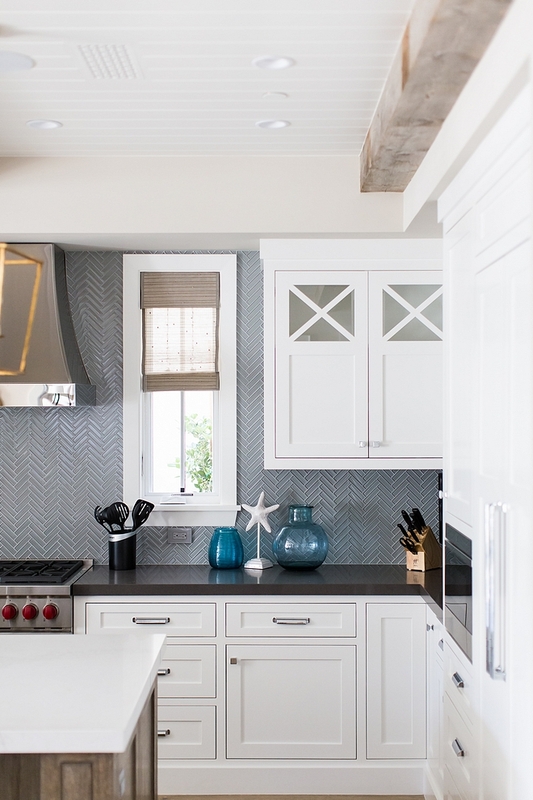 Other Beautiful Herringbone Tiles: here, here (marble), here, here, here & here. 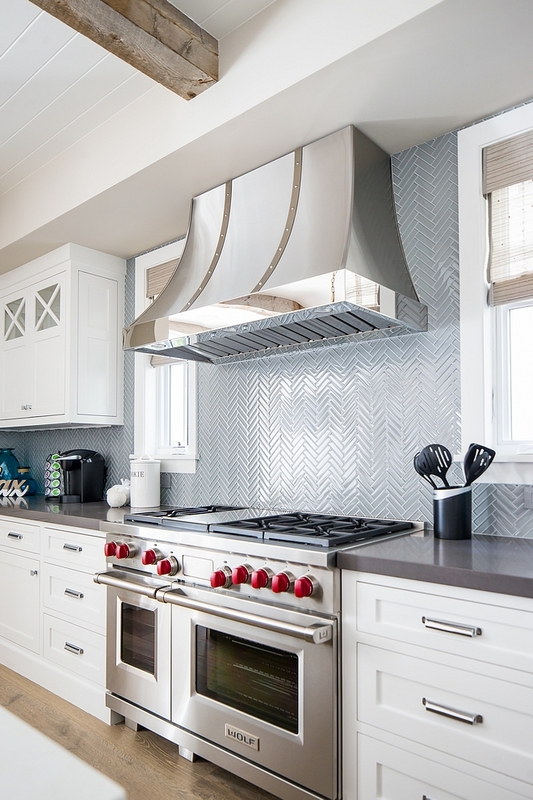 The kitchen hood is Modern – Aire Custom 48 ” Hood – similar here. Cabinets are Paint Grade, Face framed throughout with upper cabinets with X insets. 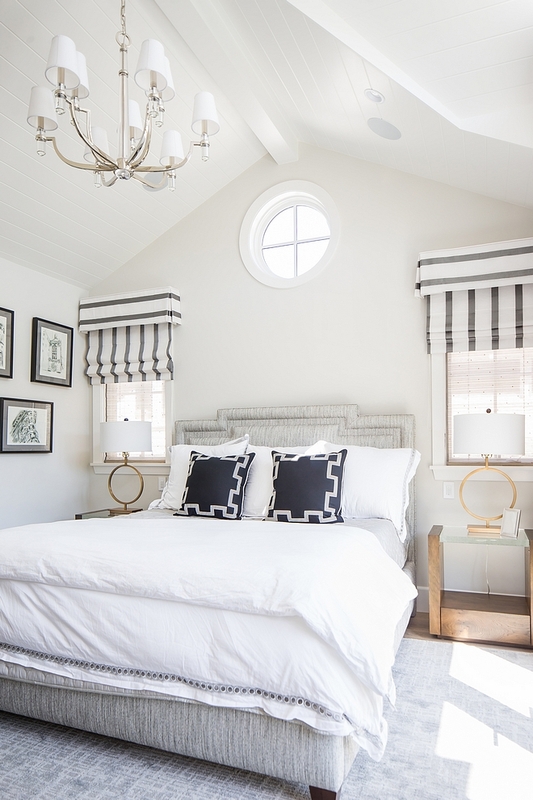 Paint color is Dunn Edwards DET649 Carrara in semi-gloss. 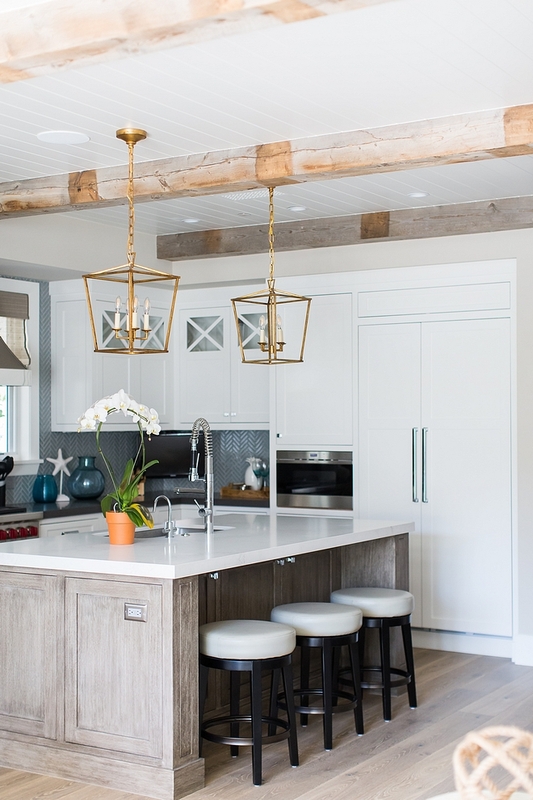 Kitchen ceiling features real reclaimed wood beams and Tongue and Groove. 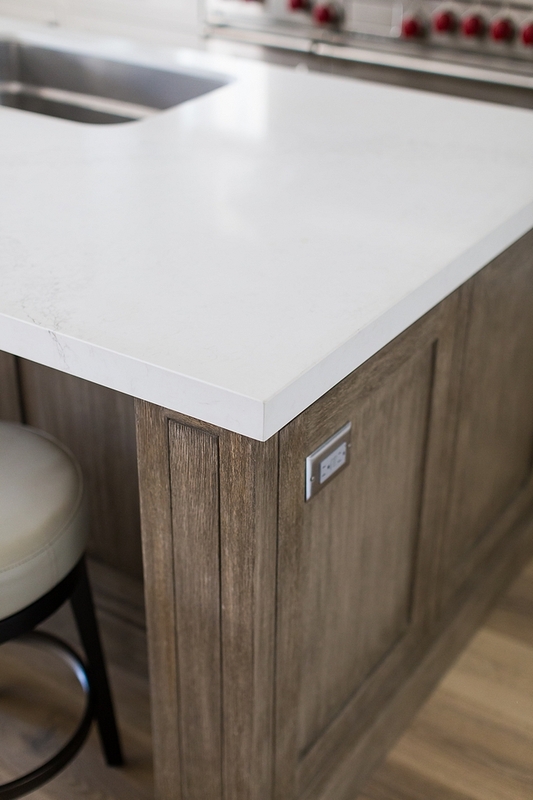 The island countertop is White Quartz, Caesarstone Calacatta Nuvo, Mitered Edge. Kitchen sink is by Franke. 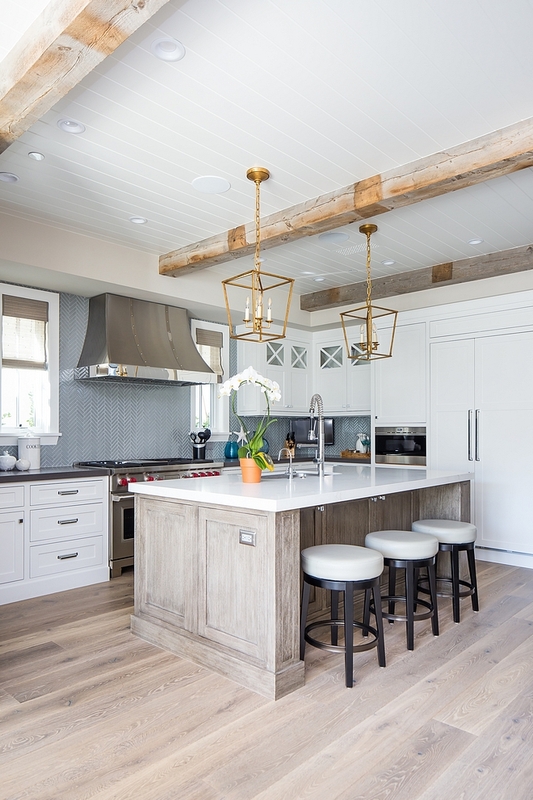 Kitchen Pendants: Visual Comfort (Small) – similar here (more affordable). Kitchen faucet is Aquabrass – similar here & here. 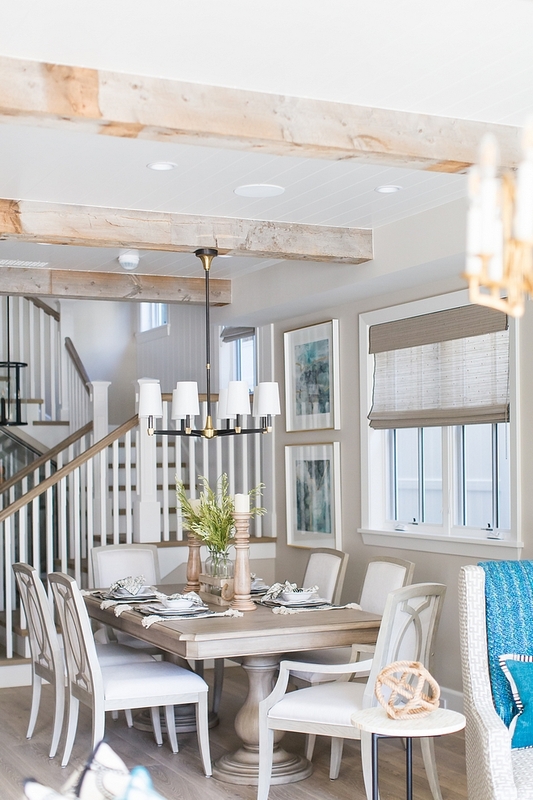 The kitchen opens directly to the dining room and family room (on right). Dining Chairs: Host Chairs – Side Chairs. 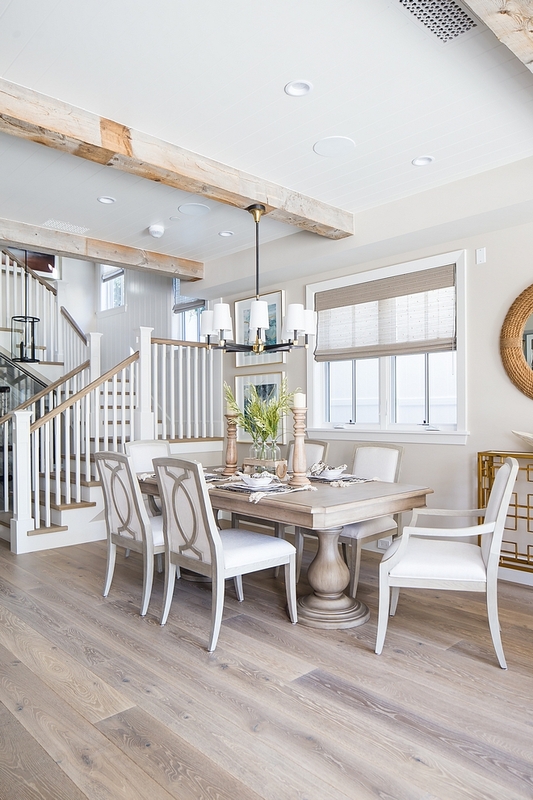 Hardwood flooring throughout the house is 7” Wide – Random Length – engineered European oak, light wire brush, light with Matte Oil Finish – similar here (this one is very similar!) & here (lighter). 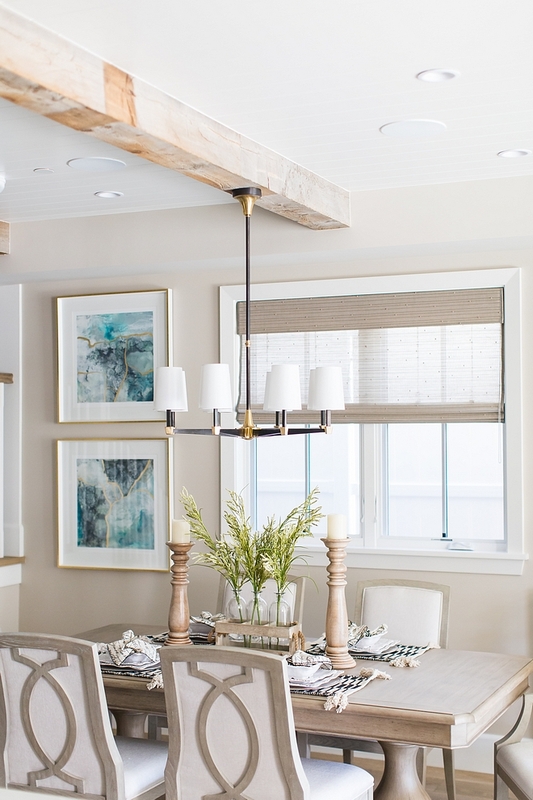 Dining Room Chandelier is RH Modern Milos – similar here & here. Mirror: Here, Here, Here & Here. Teal Throw: Here & Here. 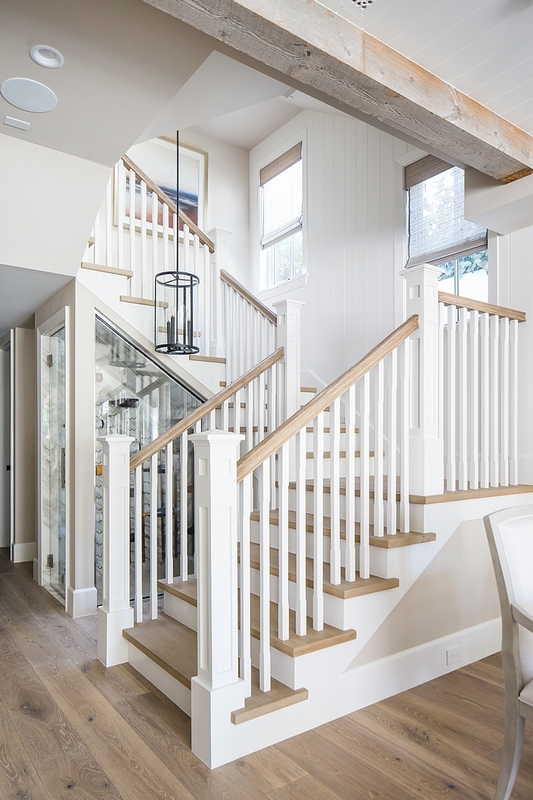 The staircase features White Oak threads, White Oak handrail and vertical tongue and groove paneling. 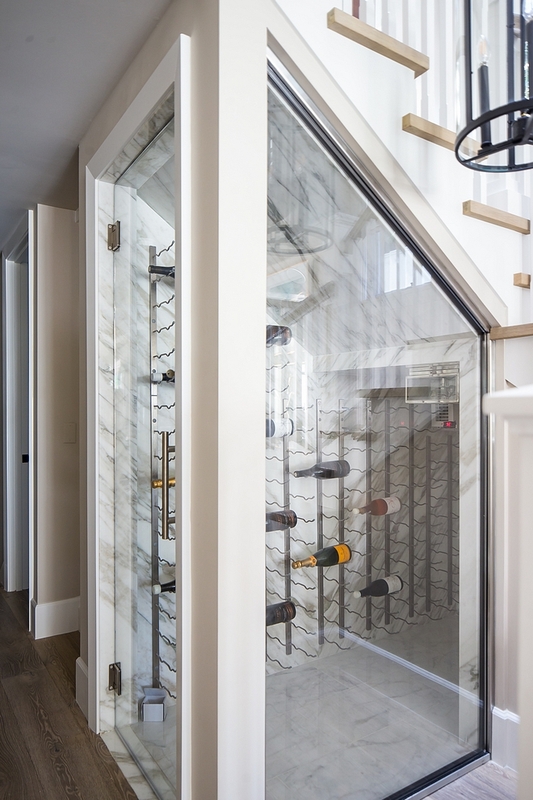 The under stair wine cellar features stone slab walls, vintage-style wine racks and custom glass enclosure and door. 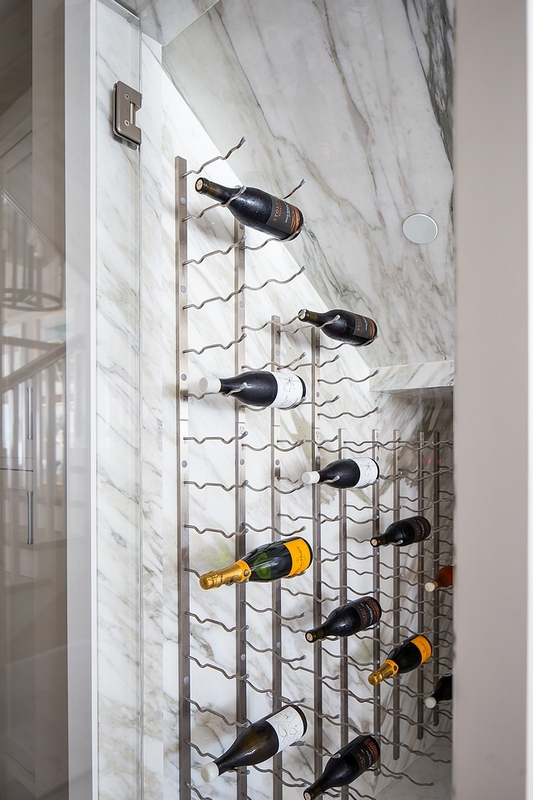 Similar wine racks can be found here. 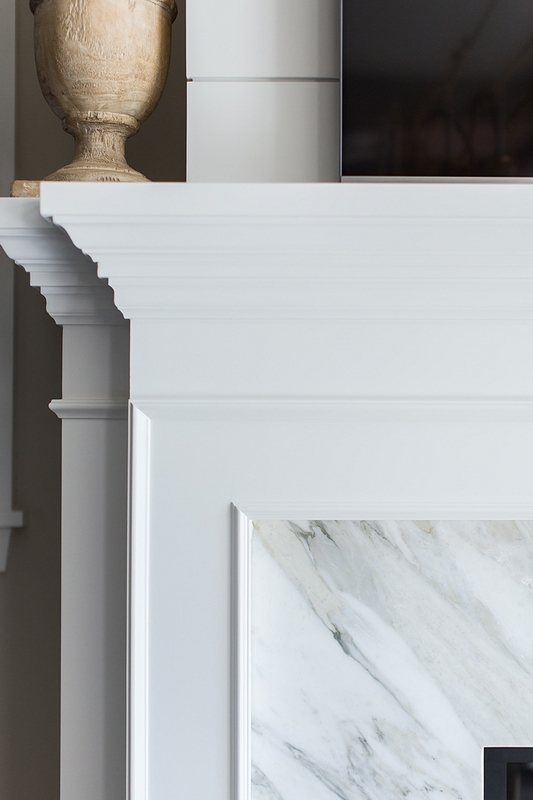 Trim and Millwork Paint Color: Dunn Edwards DET649 Carrara. 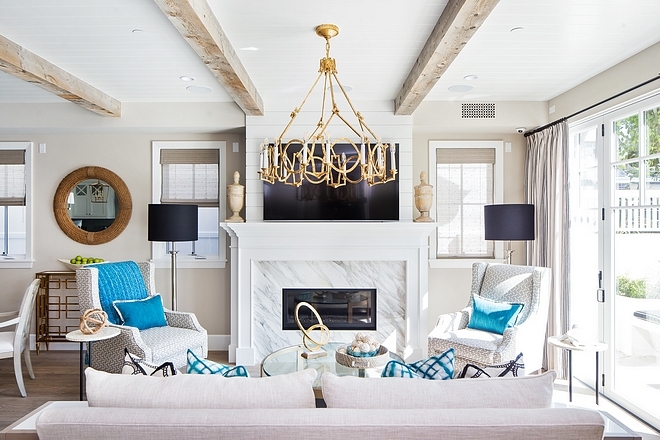 Lighting is custom – similar here, here & here. 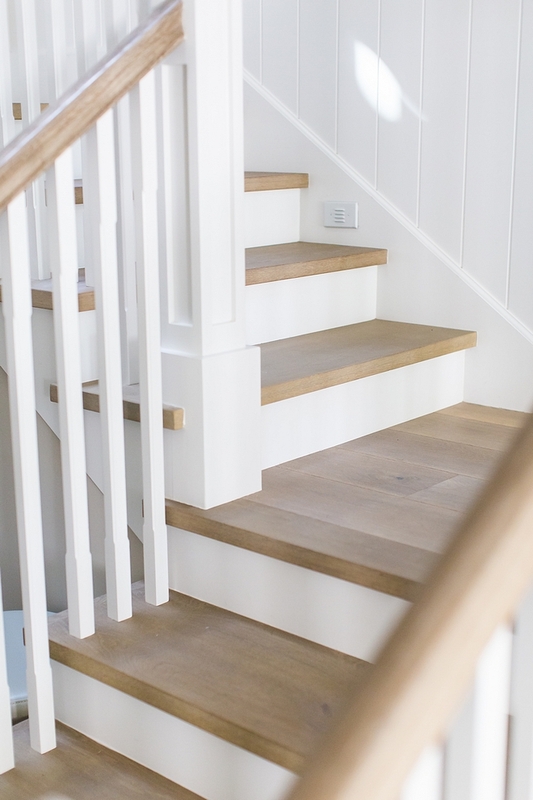 Treads are 1” thick solid white oak to match wood floor. Beautiful Mini-Brick Tile: here & here. Washer & Dryer: Electrolux (set). Faucet: Kohler (great & affordable!). 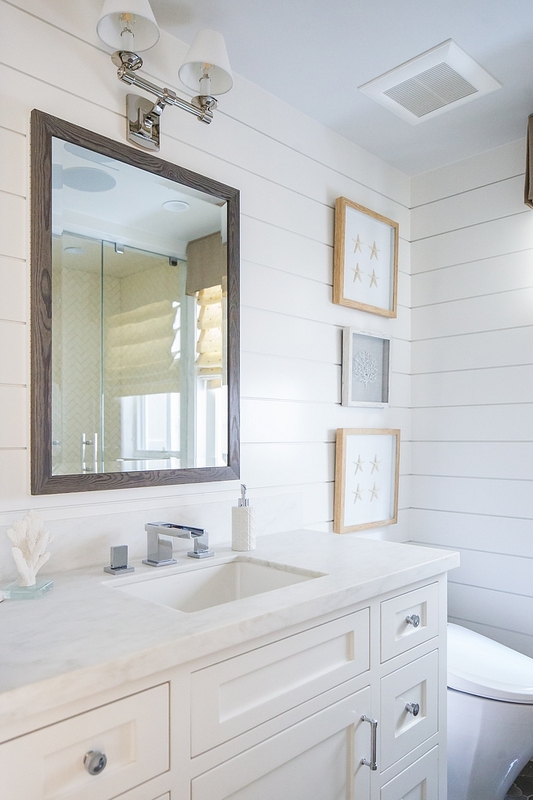 The secondary bathrooms feature horizontal shiplap. 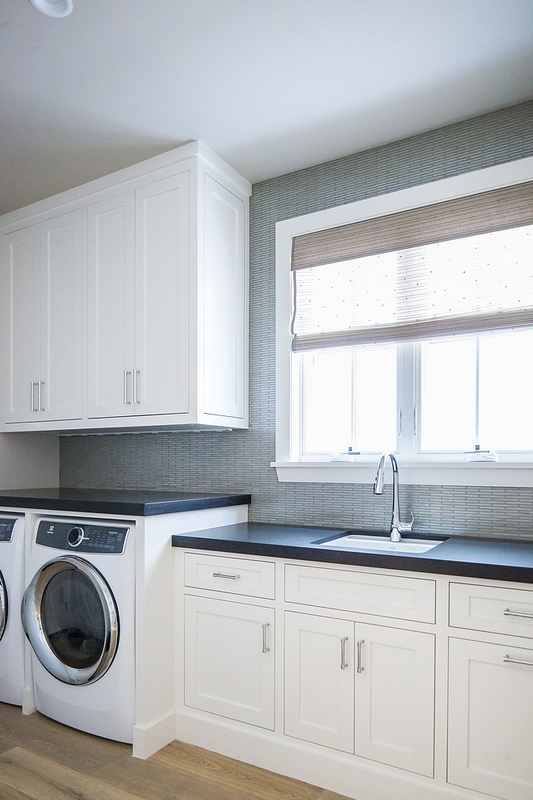 Cabinet paint color is Dunn Edwards DET649 Carrara and countertop is Honed Pacific White Marble – Edge detail: 1 ½” miter with 6” backsplash. Floor Tile: Arabesque Crackle – similar here. Faucet: Lacava – Beautiful Modern Faucets: here, here, here, here, here, here (for vessel sinks), here & here. Artwork: here – similar here. 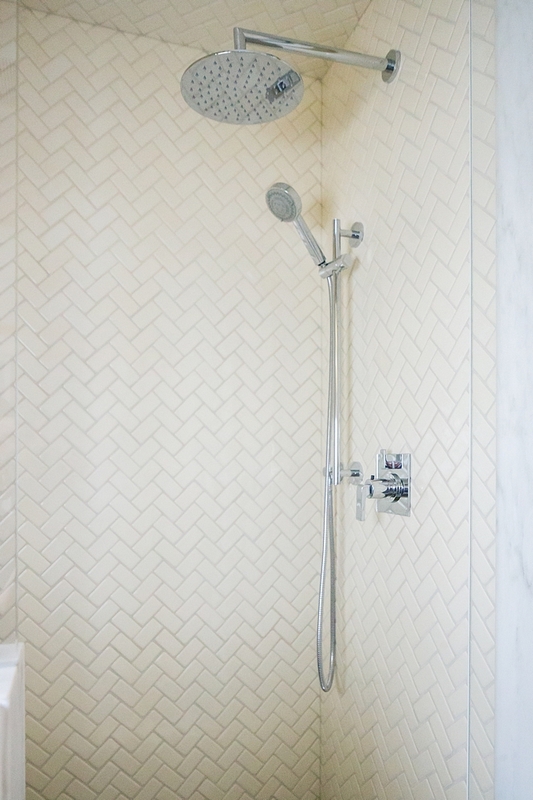 Shower tile is Polar Crackle Herringbone – similar here. 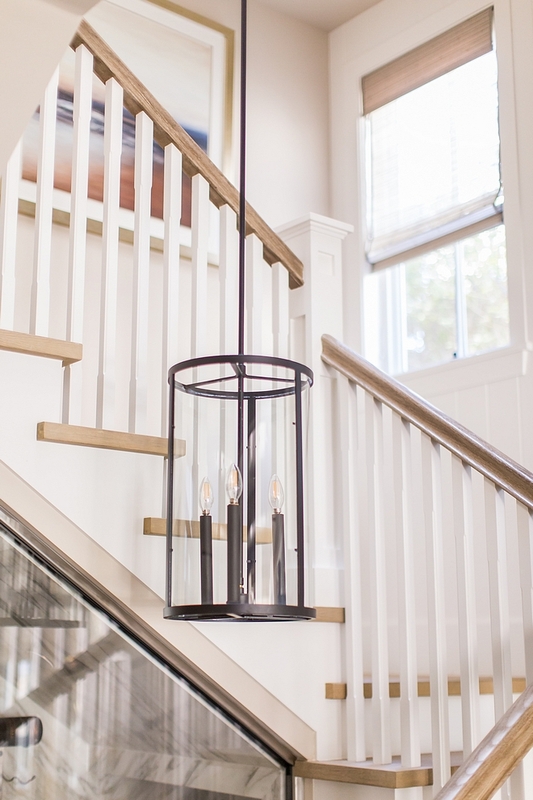 Chandelier: Hudson Valley – 24″ – Old Bronze. 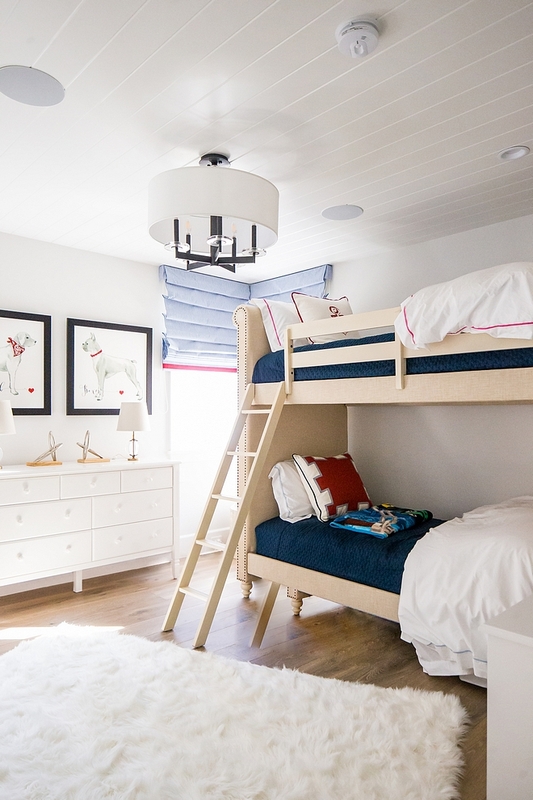 Similar Chesterfield Tufted Bunk Bed: here, here & here. 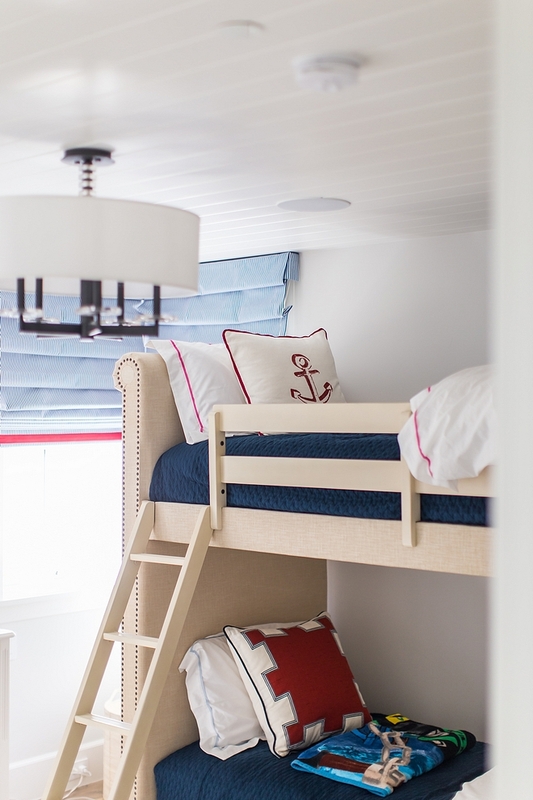 Other Beautiful Bunk Beds: Here. White Dressers: Here (affordable), Here, Here, Here, Here, Here, Here, Here & Here. Paint color is Dunn Edwards DE6213. Bathroom countertop is Black Leather Zimbabwe – 1 – 1/2 miter edge with 5” backsplash at counter. Floor tile is Thassos Bardiglio hex tile. Beautiful Marble Hex Tiles: here, here & here. 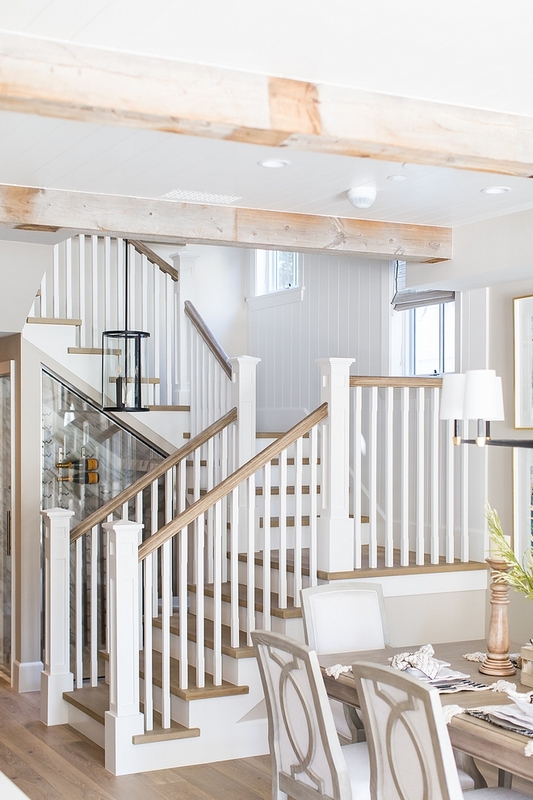 Shiplap paint color is Dunn Edwards DEW382 Faded Gray (flat). Dunn Edwards DE6226 Foggy Day (flat). 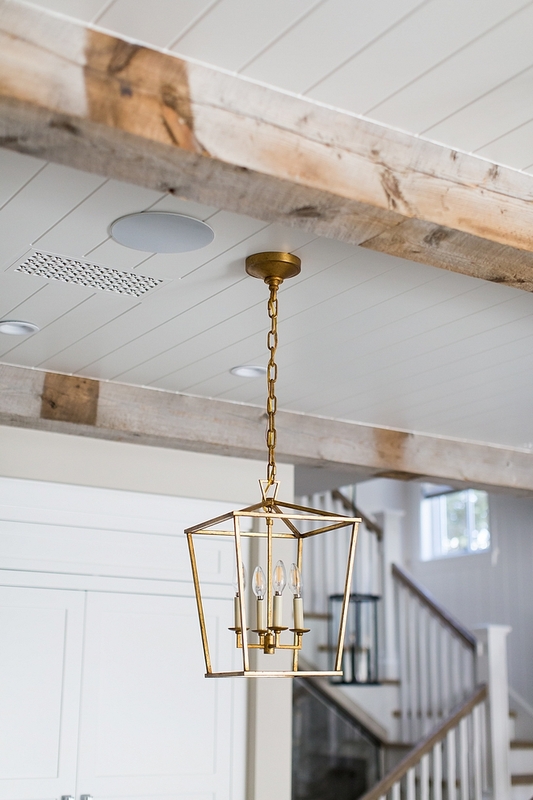 Chandelier is Hudson Valley – 9 Lights. 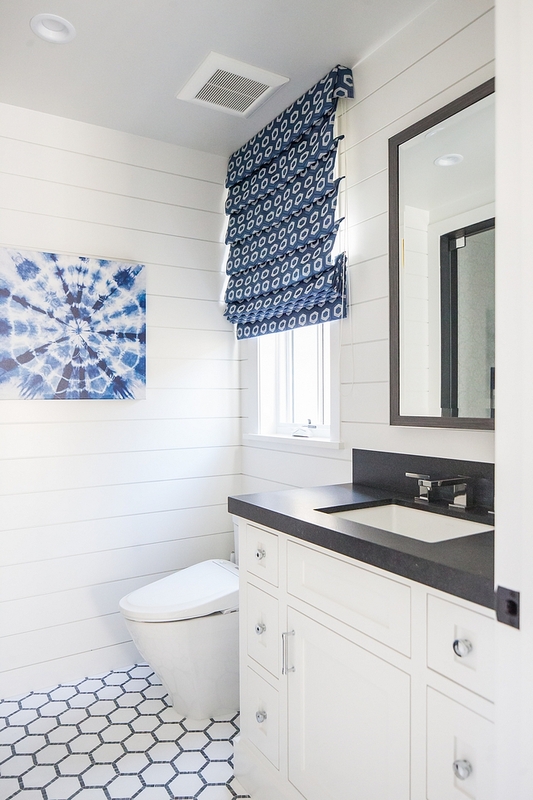 The master bathroom wall paint color is Dunn Edwards Foggy Day and cabinets are Dunn Edwards Carrara. 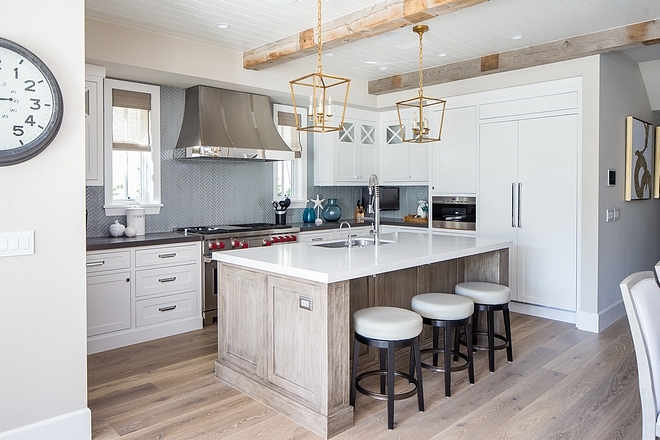 Countertop is White Quartz, Caesarstone Calacatta Nuvo with 5” backsplash. Faucet: California Faucets – similar here. Mirrors: Custom – similar Mirrors: here, here, here & here. Wall slab is White Quartz, Caesarstone Calacatta Nuvo. 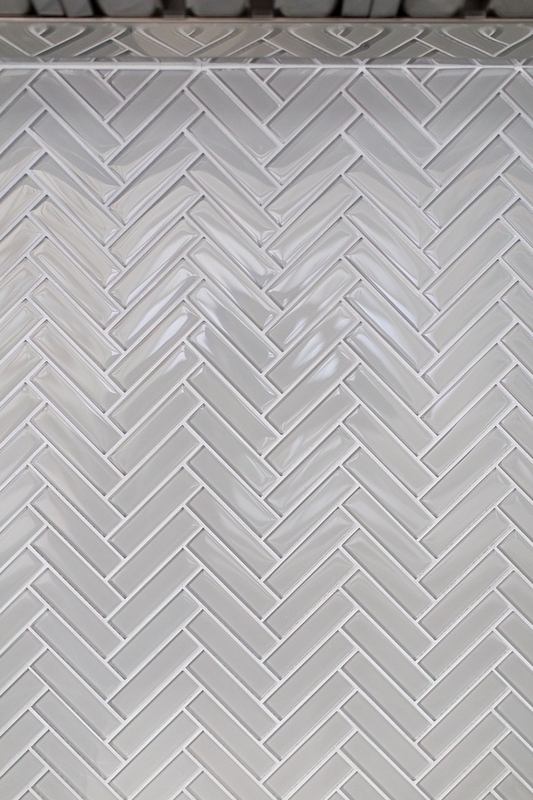 Floor Tile: 6” white Thassos border (similar here) with White Thassos herringbone 2×12 – similar here. Accent Tile: 4×16 Interstyle ORE Mica – similar here. Round Rain Showerhead: 10″ Jaclo. Similar Complete Set: here. 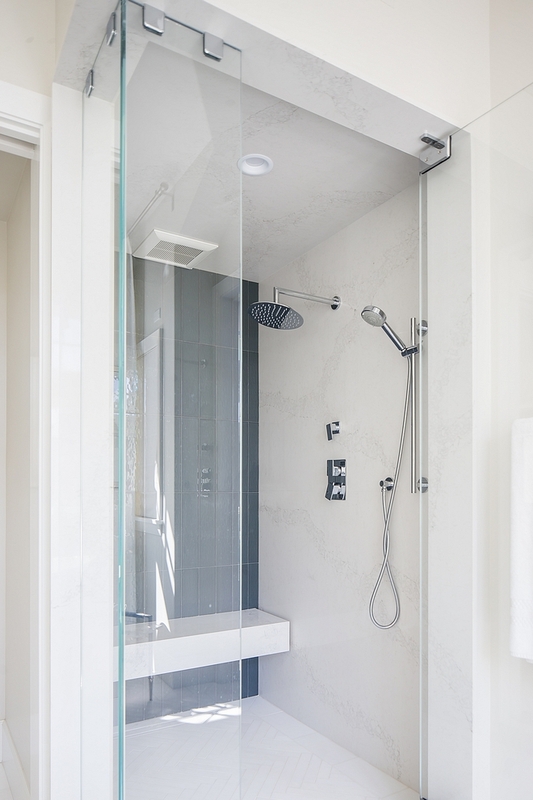 Hand Shower: California Faucets – similar here. 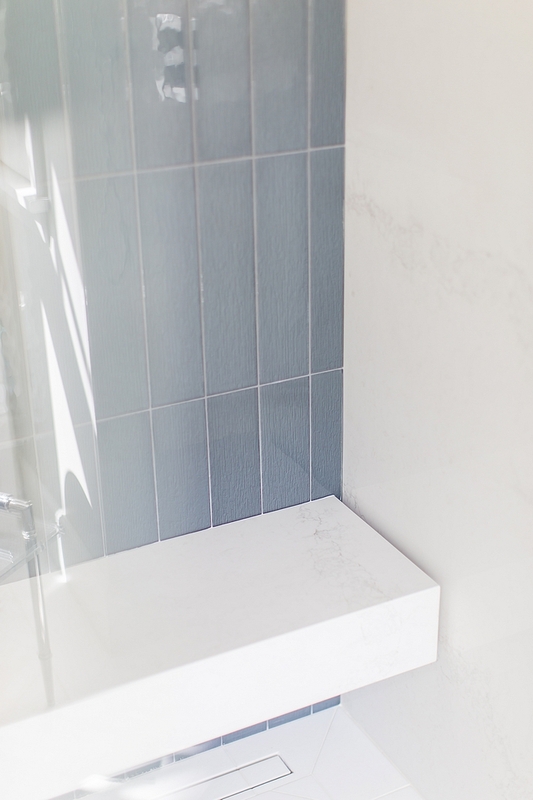 Shower bench is also Quartz, Caesarstone Calacatta Nuvo. 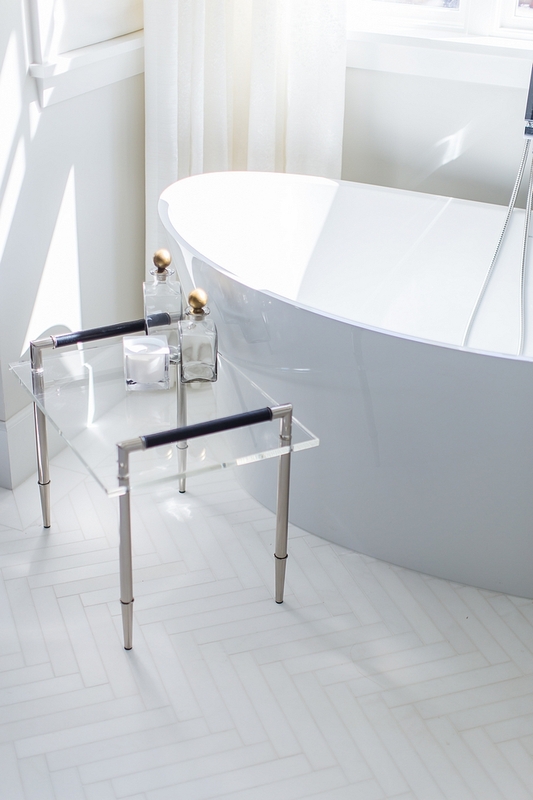 The freestanding tub is BainUltra BEVLOF00T-01 Evanescence – similar here, here, here, here & here. Tub Filler: Lacava – similar here & here. Floor tile is White Thassos herringbone. Deck is Trex decking system. Faucet: Newport Brass – in Stainless Steel. Isn’t this a perfect place to relax? I love the comfy outdoor chairs and the custom firepit. 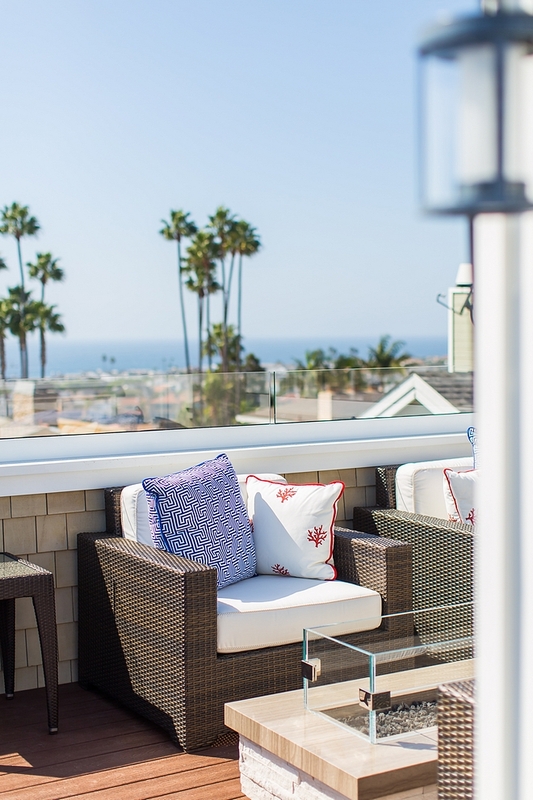 Similar Outdoor Wicker Furniture: Here. 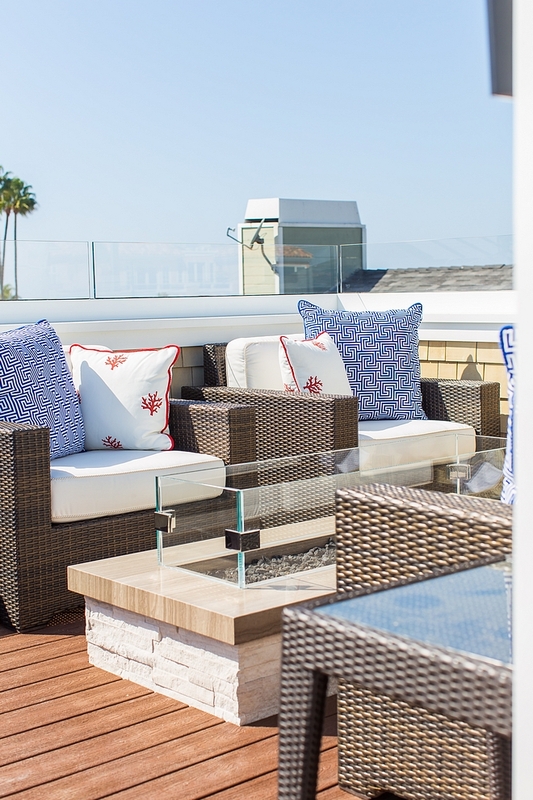 Great Outdoor Pillows: Here & Here.